The American composer George Templeton Strong spent very few of his ninety-two years in America, with the result that his music has scarcely ever been played in his native country. Born in New York City and the son of the New York Philharmonic’s President, he went to Germany at the age of twenty-three. He returned nine years later, having studied in Leipzig, Weimar and Wiesbaden, but remained only four years. For the last fifty-six years of his life he lived in Switzerland, where besides steadily composing a large body of music he was also devoted to painting water-colours. 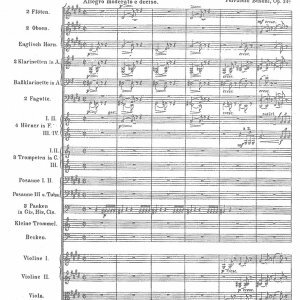 At the time when Le Roi Arthur was composed, 1915-1916, no American composer dared sail so close to Strauss and Mahler’s shores as Templeton Strong. He was an advanced modernist with a formidable technique and a deep love of literature and poetry. He wrote no operas, but there are many songs and choral works from his pen. He composed a great number of piano and chamber works too. In the orchestral sphere he was particularly fond of the symphonic poem, using Liszt and Strauss as his models, and absorbing the rich chromatic harmony of Wagner’s Parsifal. 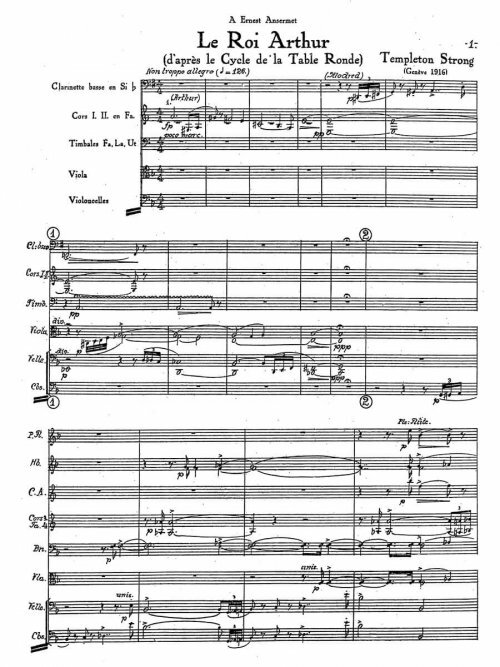 Such works as Ein Totentanz (1878), Finsternis (1879), Undine (1883), Sintram (1888) and Die Nacht (1913) prepared him for his greatest symphonic poem Le Roi Arthur, which was based on some sketches he had made while living in Boston in 1891 and completed in Geneva in 1915-1916. 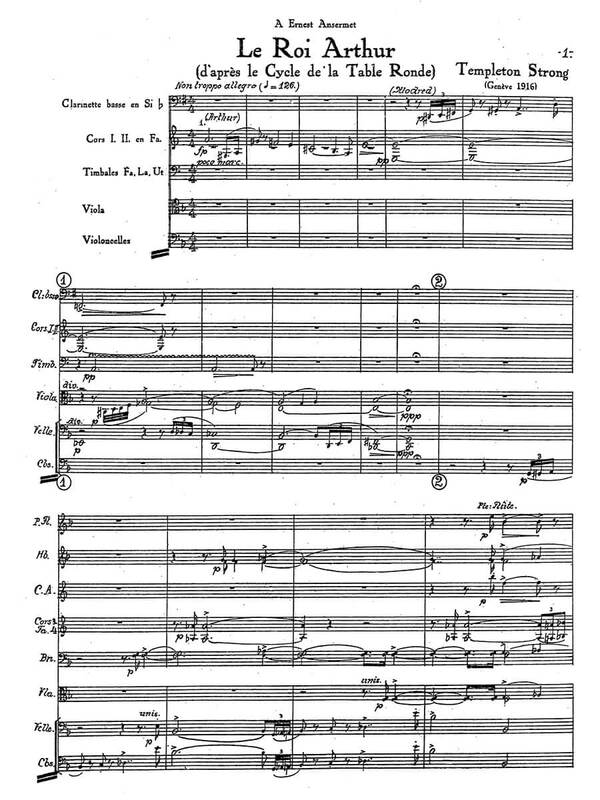 It was written for a large modern orchestra and first performed in Geneva by the Orchestre de la Suisse Romande conducted by Ernest Ansermet on 12 January 1918, and the published score was dedicated to Ansermet. Templeton Strong based the work on Tennyson’s Idylls of the King, which are in turn drawn from Sir Thomas Malory’s Le Morte d’Arthur. The music is intended to evoke the legend of King Arthur, his knights, his love of Guinevere and her tragic betrayal of him, and his death at the hands of the traitor Mordred. The composer conveniently entered indicators at certain points in the score itself, namely on pages 1 (where motifs for Arthur and Mordred are identified), 4 (Arthur’s youth), 10 (the sword Excalibur), 23 (the Round Table), 79 (Excalibur again), 94 (a battle cry), 127 (fight to the death), 130 (the death of Mordred), and finally 133 (the death of Arthur). In addition it may be assumed that the theme shared by the violins and cellos on page 40 represents Guinevere and serves as a second subject in the symphonic sense. Her love scene with Lancelot at this point in the drama is observed by Mordred. The last part of the work reaches a climax in the fatal confrontation of Arthur and Mordred, and the death of them both. Le Roi Arthur has recently been recorded by the Moscow Symphony Orchestra under the Swiss conductor Adriano, who was introduced to Templeton Strong’s music by Ernest Ansermet himself.